SARAH PALIN AND THE TEA PARTY EXPRESS will rally on the Boston Common this morning, and if everything you know about the tea partiers comes from talking heads on your TV screen or big-name pundits in the prestige press, you're probably cringing in expectation of an ugly invasion by hate-filled, out-of-control bigots. It was only a couple of weeks ago, after all, that the New York Times's Frank Rich was informing his readers that Tea Party protesters opposing the Obama health-care bill were "goons," so inflamed by "homicidal rhetoric" -- Rich cited the protesters' chant "Kill the bill!" as an example -- that they had turned into latter-day SS troops engaged in a "small-scale mimicry of Kristallnacht." To Washington Post columnist Colbert King, on the other hand, tea partiers bring to mind not the Third Reich but the segregationists of the pre-civil rights South. "Those same jeering faces," King wrote on March 27, "could be seen gathered around the Arkansas National Guard troopers who blocked nine black children from entering Little Rock's Central High School in 1957." He also remembered those faces "exploding with yells of excitement" when David Duke "spewed vitriolic white-power rhetoric" at a rally in 1991. Then there is Keith Olbermann of MSNBC, who concedes that there might be more to the Tea Party movement than unadulterated racism. There is also, he said in a recent broadcast, "blind hatred, a total disinterest in the welfare of others, and a full-flowered self-rationalizing refusal to accept the outcomes of elections." To anyone who knows real Tea Party members or has attended a Tea Party event, these characterizations are so absurdly scurrilous that it's hard to imagine anyone could possibly believe them, let alone utter them in good faith. Yet some people will believe anything, especially when it suits their political prejudices. In the 1950s there were right-wingers who swallowed the John Birch Society's claim that President Dwight D. Eisenhower was "a conscious, dedicated agent of the communist conspiracy." There were left-wingers a half-century later who insisted that George W. Bush knew about the 9/11 attacks in advance. So we shouldn't be surprised when some grow-the-government liberals convince themselves that the tea partiers' real agenda isn't opposition to ObamaCare and exploding federal budgets, but nostalgia for Nazism and Jim Crow. Like any enthusiastic grassroots movement, the Tea Parties are bound to attract a sliver of disreputable cranks, some of whom may seek attention from credulous or cynical members of the media. And there are reports that Tea Party opponents have been recruiting infiltrators to crash the rallies and discredit them with fabricated hate speech and extremist rhetoric. Head over to the Boston Common this morning, however, and you will find neither fascists nor Klansmen, but a sea of sincere and energized citizens worried about the direction in which their country is headed and alarmed by the vast aggrandizement of government power. NPR's Juan Williams, the bestselling civil-rights author and nobody's idea of a conservative, has warned Democrats that they demonize the Tea Parties at their peril. "Tea party outrage over health-care reform, deficit spending, and entitlements run amok is no fringe concern," Williams wrote recently. Contrary to the way they have been maligned on the left, "tea party activists are surprisingly mainstream when it comes to their grievances about politics." They are mainstream in other ways too. "Tea Party supporters skew right politically," Gallup reported last week, "but demographically, they are generally representative of the public at large." 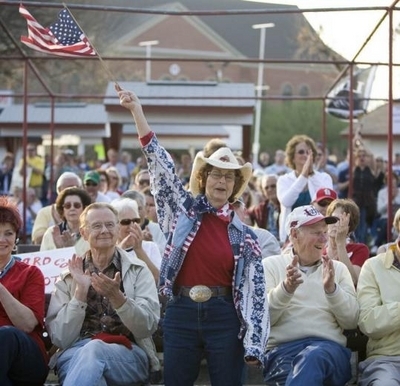 In terms of age, education, employment, and, yes, even race, the tea partiers are a pretty typical slice of America. Contention over the scope and legitimacy of government authority is quintessentially American. So is the struggle to balance individual liberties with national needs. Today's Tea Party in Boston is only the latest link in a chain reaching back to that first Boston Tea Party in 1773. You don't have to be a fan of Sarah Palin or a foe of President Obama to welcome the tea partiers to town or to admire their civic engagement. "We are not obligated to support the president's policy because . . . this is the United States of America and dissent is patriotic." So Howard Dean declared in 2003, and so insisted countless liberals and Democrats during the George W. Bush years. If it was patriotism then, it's patriotism now. Stop by the Common today, and you can see it for yourself.